The Malvales are an order of flowering plants. As circumscribed by APG II-system, the order includes about 6000 species within 9 families. The order is placed in the eurosids II, which are part of the eudicots. The plants are mostly shrubs and trees; most of its families have a cosmopolitan distribution in the tropics and subtropics, with limited expansion into temperate regions. An interesting distribution occurs in Madagascar, where three endemic families of Malvales (Sphaerosepalaceae, Sarcolaenaceae and Diegodendraceae) occur. Many species of Malvaceae sensu lato are known for their wood, with that of Ochroma (balsa) being known for its lightness, and that of Tilia (lime, linden, or basswood) as a popular wood for carving. Fruit of the cacao tree (Theobroma cacao) are used as an ingredient for chocolate. Kola nuts (genus Cola) are notable for their high content of caffeine and, in past, were commonly used for preparing of various cola drinks. Other well-known members of Malvales in the APG II sense are daphnes, hibiscus, hollyhocks, okra, baobab trees, cotton, and kapok. The morphology of Malvales is diverse, with few common characteristics. Among those most commonly encountered are palmate leaves, connate sepals, and a specific structure and chemical composition of the seeds. The cortex is often fibrous, built of soft phloem layers. Early classifications such as that of Dahlgren placed the Malvales in the superorder Malviflorae (also called Malvanae). Family boundaries and circumscriptions of the "core" Malvales families, Malvaceae, Bombacaceae, Tiliaceae, and Sterculiaceae, have long been problematic. A close relationship among these families, and particularly Malvaceae and Bombacaceae, has generally been recognized, although until recently most classification systems have maintained them as separate families. With numerous molecular phylogenies showing Sterculiaceae, Bombacaceae, and Tiliaceae as traditionally defined are either paraphyletic or polyphyletic, a consensus has been emerging for a trend to expand Malvaceae to include these three families. This expanded circumscription of Malvaceae has been recognized in the most recent version of the Thorne system, by the Angiosperm Phylogeny Group, and in the most recent comprehensive treatment of vascular plant families and genera, the Kubitzki system. 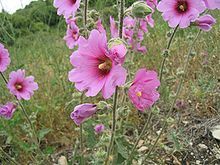 The dominant family in the APG II-system is the extended Malvaceae (Malvaceae sensu lato) with over 4000 species, followed by Thymelaeaceae with 750 species. This expanded circumscription of Malvaceae is taken to include the families Bombacaceae, Sterculiaceae and Tiliaceae. Under the older Cronquist system the order contained these four "core Malvales" families plus the Elaeocarpaceae and was placed among the Dilleniidae. Some of the currently included families were placed by Cronquist in the Violales. ^ Bayer, C. and K. Kubitzki. 2003. Malvaceae, pp. 225–311. In K. Kubitzki (ed. ), The Families and Genera of Vascular Plants, vol. 5, Malvales, Capparales and non-betalain Caryophyllales. Judd, W.S., C. S. Campbell, E. A. Kellogg, P. F. Stevens, M. J. Donoghue (2002). Plant Systematics: A Phylogenetic Approach, 2nd edition. pp. 405–410 (Malvales). Sinauer Associates, Sunderland, Massachusetts. ISBN 0-87893-403-0. Kubitzki, K. and M. W. Chase. 2003. Introduction to Malvales, pp. 12– 16. In K. Kubitzki (ed. ), The Families and Genera of Vascular Plants, vol. 5, Malvales, Capparales and non-betalain Caryophyllales. du Mortier, B. C. J. (1829). Analyse des Familles de Plantes, avec l'indication des principaux genres qui s'y rattachent, p. 43. Imprimerie de J. Casterman, Tournay. Wikimedia Commons has media related to Malvales. This page was last edited on 23 February 2019, at 22:57 (UTC).